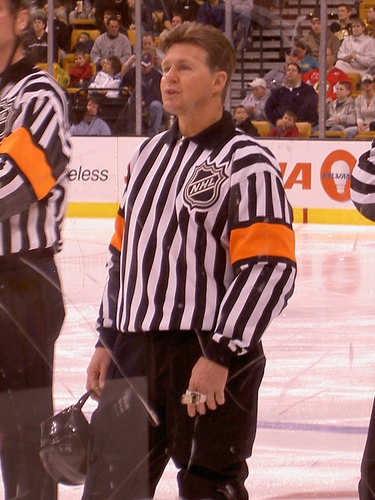 In 2010, Kerry Fraser, who had widely been considered one of the fairest and most consistent referees by NHL players and coaches, retired from officiating after a 30-year career in the league and stints in the minors. The Final Call, published after that season, details the ups and downs of his career. Although it is centered on the 2009-10 campaign, Fraser also takes readers back in time to games in the 80s and 90s while detailing some of the all-time hockey greats he met along the way. 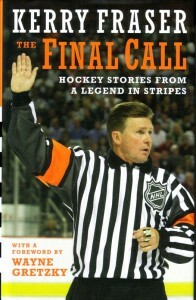 In the book’s early chapters, he recalled how he got started as a referee. He skated for the first time at 15 months old on the influence of his father Hilt, who played in the IHL and displayed a “never quit” attitude. When it became clear he didn’t have a future in the NHL as a player, Ted Garvin, who played in the IHL with Hilt, suggested Fraser look into officiating. Fraser took the suggestion and attended the Hailburton Referee School in 1972, where attendees played hockey games and took turns officiating for 10-minute periods. Like many prospects, he started working in the minors and he earned $85 a game, needing an additional part-time job to cover his bills. He landed his first NHL contract in 1973, but this time, he received a $6,500 base salary and a $1,000 bonus. Fraser learned his trade by attending NHL games on his days off and observing the officials, noting what kind of personalities and styles they brought to a game. Throughout the book, readers learn that Fraser has a training regimen in the offseason, as he has done inline skating, swimming and bicycling to keep in shape, even doing so on family vacations. Before his final season in the summer of 2009, he joined other refs at a military training base in Meaford where Canadian Forces train before being deployed to Afghanistan. There, he aggravated an ankle injury but still pushed through an obstacle course and physical tasks such as jogging and rope climbing. On the topic of injuries, Fraser shows the same attitude his father displayed when he was growing up. He was not immune to being injured working games, breaking a fibula from a Paul Coffey slapshot back in 1982 and sustaining a back injury in 1995 where he couldn’t stand or sit between periods. Fraser remembers how he would lay on the ice to stretch out just to keep going. He especially drives the point home that he doesn’t have a glamorous life. For example, referees are responsible for doing their own laundry and hauling their equipment to each city, as they don’t have equipment managers to handle that. He also talks about time away from his family, missing one of his daughters’ First Communions because he had a game and racing home when his wife Kathy had a miscarriage in the 1980s. He explains that family and faith keep him grounded and credits Kathy for being able to work as essentially a single parent during the season. The flashbacks to the different eras in which he worked come alive as he talks about games where he got his first glimpses of stars such as Mario Lemieux and Sidney Crosby. On the ice, his biggest challenges were staying calm and in control with players who were frustrated by their teams’ performances. He discussed repeatedly how officials have a limited amount of time (“a fraction of a millisecond”) to understand a call and make a decision. He even expressed frustration at a game he was watching when it took nine minutes for the war room in Toronto to decide if a goal had been scored. “Refereeing is an art form,” Fraser wrote. He feels that referees should feel empowered to make a decision without the war room and said one of the problems with today’s NHL is that officials cannot develop relationships with players. When things got personal on the ice, Fraser did not stand for it. He talked about times such as Tyson Nash mocking Theo Fleury for his drug and alcohol addictions and Claude Lemieux complaining that Matthew Barnaby was under his skin for making fun of his divorce. Fraser expressed, “Certain things are off-limits, and a guy’s family is one of them.” In both instances, he made the offending players apologize and shake hands with their opponent. In the present time, Fraser’s final season takes fans to the Winter Classic between the Flyers and the Boston Bruins at Fenway Park, one of the five games he worked at Air Canada Centre in Toronto and his last game at Wachovia Center between the Flyers and the New York Rangers. The Winter Classic was special even for the officials, as he was excited to return to his own roots and get dressed in the Red Sox umpires’ room at Fenway. Although the Rangers’ playoff hopes ended in his final game, several players still congratulated him, and he also received well wishes from then-Philadelphia coach Peter Laviolette, Mark Messier and Gretzky. He wore nine jerseys in that game to present to family members afterwards. Overall, this is an interesting read for anyone who is looking for a hockey book that is about more than the players’ lives on and off the ice. Every hockey fan gets frustrated with the refs, and Fraser demonstrates why that is and proves that officials are humans as well. Although he stated that during his career, he appeared cocky on the ice and not relaxed, he shows his efforts to improve and be treated with respect. He never lost his cool even in the face of death threats, injuries and high-pressure games.